For the in-law’s Christmas gifts last month, I went with two criteria: homemade and edible. It would just be wrong to not share these recipes with you (second one coming next week! 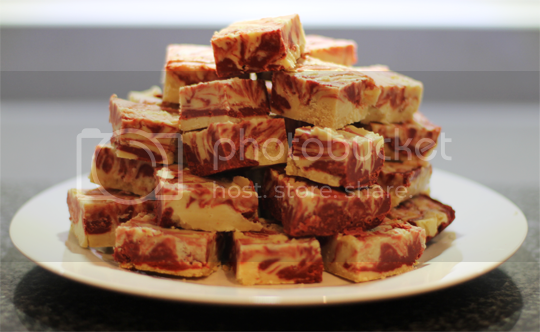 ), so here’s the first – White Chocolate and Red Velvet Fudge. Mmmm. Not only does it look damn impressive (if I do say so myself), but it tastes really good too. And it’s pretty simple to make – so you have no excuse not to crack this one out next time you’re short on gift ideas! Anyone with a sweet tooth will love it. The original recipe actually comes from this one from The Cafe Sucre Farine but I’ve converted to metric measurements and switched up some ingredients where some of the things called for aren’t easily available in the UK. Enjoy! Before you start any actual cooking, there’s a few things you’ll need to prepare first. 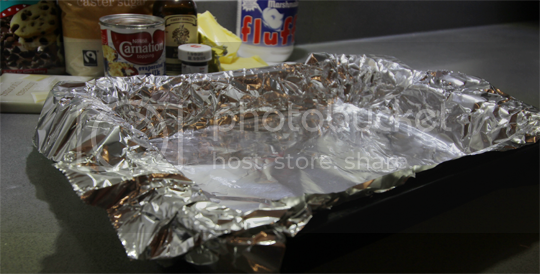 Line a suitable sized tin or dish (not sure what mine is off the top of my head, about 7×10″ I guess) with two layers of foil. This’ll make it much easier to lift the fudge out when it’s set. Spray it lightly with a flavourless oil or low calorie cooking spray like FryLight, and wipe out the excess with kitchen roll. Get two large spoons at the ready, as well. 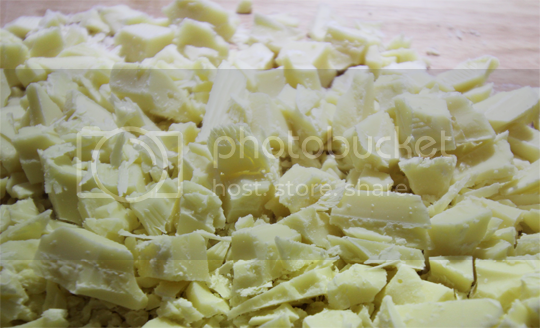 If you’re using bars of white and dark chocolate rather than chips, give them a rough chop so the pieces are smaller and will melt quicker. 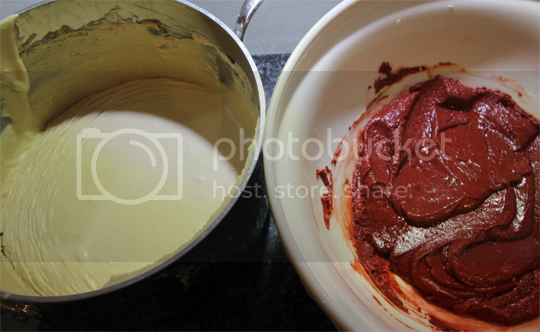 Keep the white chocolate aside, and pop the dark chocolate in a large, heatproof mixing bowl along with the red food colouring. 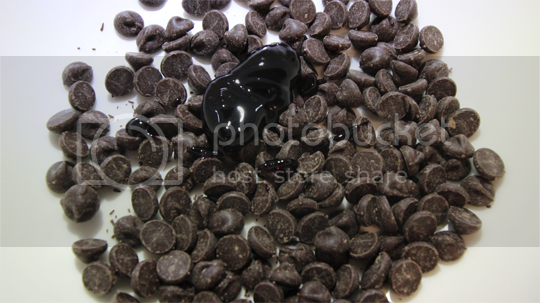 How much colouring you’ll need will depend on what type you’re using – liquid food colouring typically needs more to cut through the colour of the dark chocolate (the original recipe uses 3 tbsp liquid food colouring), but mine is a gel colour so I just used a good smudge of that. 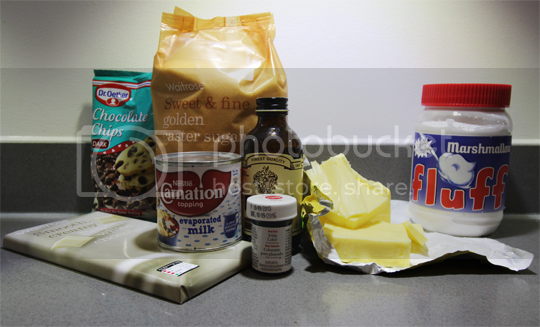 Ok, all prepared – let’s get cracking. Put the sugar, butter and evaporated milk in a large, heavy-bottomed saucepan and melt together on a medium-high heat, stirring frequently. 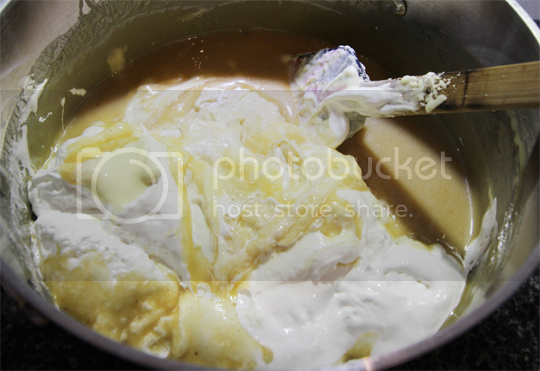 Once the mixture reaches boiling point it’ll start bubbling away furiously – do not leave it!. Stir constantly for 5 minutes. Be careful not to stir too vigorously and splash yourself, the mixture is hawt. Remove from the heat and immediately dump in the whole jar of marshmallow fluff and white chocolate and stir it in quickly to melt. Quickly (are you sensing a theme here?) pour half of the mixture into the mixing bowl with the dark chocolate and food colouring, and give that a good stir to melt too. 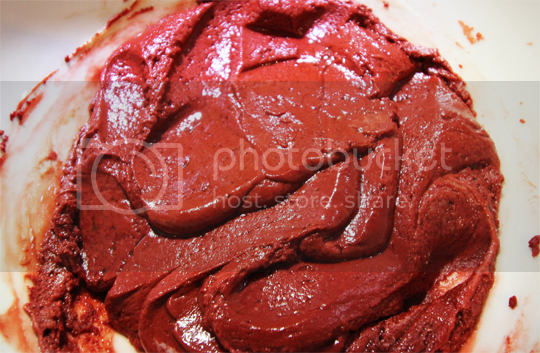 Now you should have a bowl of bright red sludge, and a saucepan of creamy white sludge. I was trying to go like greased lightning so I completely forgot to take a picture of the next step, but now you’ll need to drop spoonfuls of each colour randomly into the foiled tin. 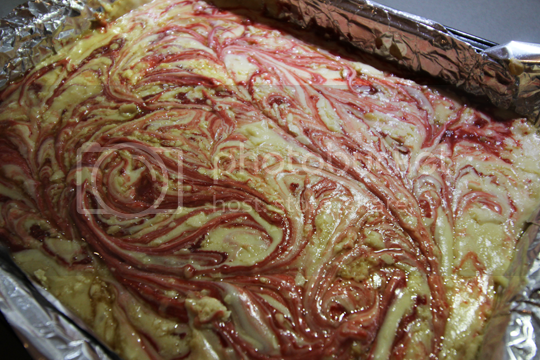 Once you’ve used it all up, use the tip of a sharp knife to drag and swirl the two colours together in a marbled pattern. Make sure you get down to the bottom of the tin, otherwise the bottom won’t be marbled – but do try and be careful not to cut through the foil! When you’re done it should look something like the above. 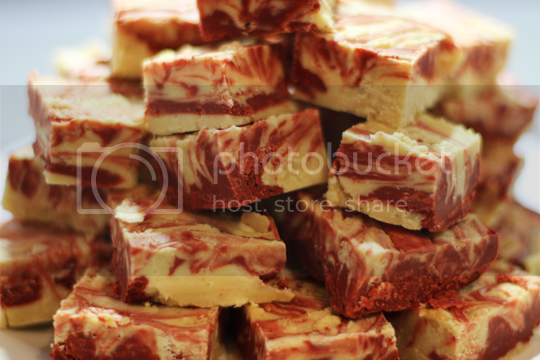 TIP: Despite trying to be quick, taking photos did slow me down so by the time I’d spooned all the fudge into the tin it had started to get too viscous to marble. If this happens to you, stick the tin in the oven on a low heat for a few minutes to soften, but don’t leave it too long! Pop it in the fridge overnight to set completely, then lift out of the tin by the edges of the foil and peel the sides down, then cut into squares and present however fits the occasion. Gift it, share it, and enjoy every bite of this sweet, melt-in-the-mouth fudge. Mmmm. WOW! This looks totally and utterly incredible….. I’m on a diet so this is killing me! Thanks so much for this recipe – made it and it’s a HUGE hit, I can’t stop eating it!